Laurence Young was born on August 30, 1945, in Weymouth, Massachusetts. He enlisted in the U.S. Army on August 31, 1964, and completed basic training at Fort Jackson, South Carolina, in November 1964, receiving training as a cook at Fort Polk, Louisiana, between November 1964 and January 1965. His first assignment was with the 1st Squadron of the 17th Cavalry Regiment at Fort Bragg, North Carolina, from February 1965 to May 1966, and during this time he completed airborne training and deployed to the Dominican Republic from October to November 1965 in support of the invasion there. Sgt Young deployed to Southeast Asia in June 1966, and served as a cook and then as an infantryman with the 173rd Airborne Brigade in South Vietnam from June 1966 to February 1967, and then as a team leader with the 503rd Infantry Regiment in South Vietnam from February to May 1967. He then completed Special Forces training and served with the 6th Special Forces Group at Fort Bragg from May 1967 to May 1968, followed by another tour in South Vietnam with the 5th Special Forces Group from May 1968 to April 1969, during which time he was wounded in action. After recovering from his injuries, Sgt Young served as a light weapons instructor and senior instructor with the U.S. Army Institute for Military Assistance at Fort Bragg from August 1969 to October 1974. During this time he participated in the Son Tay Raid, a clandestine mission to rescue American Prisoners of War held in North Vietnam, on November 21, 1970. His next assignment was as a light weapons leader with the 7th Special Forces Group at Fort Bragg from October 1974 to April 1975, followed by Drill Sergeant School and then duty as a Drill Sergeant at Fort Dix, New Jersey, from June 1975 to July 1977. 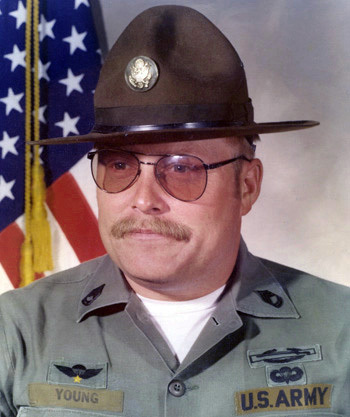 Sgt Young served as a light weapons leader with the 5th Special Forces Group at Fort Bragg from July 1977 to October 1980, and then served as a light weapons leader and operations sergeant with the 10th Special Forces Group in West Germany from October 1980 to September 1982. His final assignment was as an operations sergeant back with the 5th Special Forces Group at Fort Bragg from October 1982 until his retirement from the Army on October 1, 1984. Laurence Young died on August 6, 2009, and was buried at the Massachusetts National Cemetery in Bourne, Massachusetts. The President of the United States of America, authorized by Act of Congress, July 8, 1918 (amended by act of July 25, 1963), takes pleasure in presenting the Silver Star to Staff Sergeant Laurence Young, United States Army, for gallantry in action on 21 November 1970 as a member of an all-volunteer joint U.S. Army and Air Force raiding force in the Joint Chiefs of Staff-directed heliborne assault mission to rescue United States military personnel held as prisoners of war at Son Tay prison in North Vietnam. This valiant effort was motivated by deep compassion for his imprisoned fellow men-at-arms, and by a strong sense of military duty and national pride. Sergeant Young, after debarking from the assault aircraft, immediately came under fire from an enemy force armed with automatic weapons. He immediately returned fire, helping to suppress the enemy's fire, and continued to his objective. After moving a short distance, he came under heavy fire from a building complex. With complete disregard for his personal safety, he assaulted and neutralized the enemy position. Sergeant Young's compassion for his fellow men and his fearless attitude in combat enabled his element to successfully complete its mission. Sergeant Young's daring skill, extraordinary heroism against an armed hostile force, and extreme devotion to duty are in keeping with the highest traditions of the military service and reflect great credit on himself and the United States Army.